Vitamin B-12 plays a central role in red blood cell formation, nerve function and DNA synthesis, and you need to consume it as a regular part of your diet. Normal levels of vitamin B-12 in your body don't bother your eyes, but low levels of vitamin B-12 can negatively affect your eyesight. Make sure you're consuming enough vitamin B-12 to promote healthy eye function. A collaborative study published in the 2009 “Archives of Internal Medicine” by researchers from the National Eye Institute, Brigham and Women’s Hospital and the Harvard School of Public Health studied the effects of three treatments, including B-12, on age-related macular degeneration. 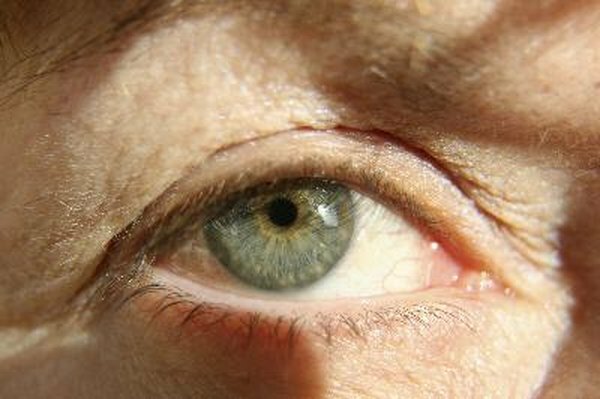 The double-blind placebo-controlled study on 5,442 women over age 40 who did not have macular degeneration divided women into two groups. One received folic acid, B-12 and B-6, while the second got placebo. After seven years, 55 cases of AMD developed in the treated group and 82 in the placebo group, and the group treated with B-12 also suffered less vision loss. Researchers concluded that B complex vitamins, including B-12, may help to prevent AMD. In the Blue Mountains Eye Study conducted by the University of Sydney, researchers evaluated the use of dietary supplements and dietary intake in the development of cataracts. Vitamin B-12 supplementation was strongly protective against cortical cataracts, which develop from the center of the lens and grow outward, according to the report presented in the July 2001 “American Journal of Ophthalmology.” . Consume at least 2.4 micrograms of B-12 each day to prevent a deficiency. If you consume meat, eggs and dairy, you'll likely exceed your daily recommended intake by adding one or two servings of animal-based foods to your diet each day. If you follow a vegan or vegetarian diet, consuming fortified foods or nutritional yeast can help you meet your intake goals, and dietary supplements taken under the supervision of a doctor can also help prevent deficiency.